Among the winners were Erin Ferranti (Community Health Award Winner), Jennifer Adamski (Critical Care Award Winner) and Janice Withycombe (Pediatric Award Winner). 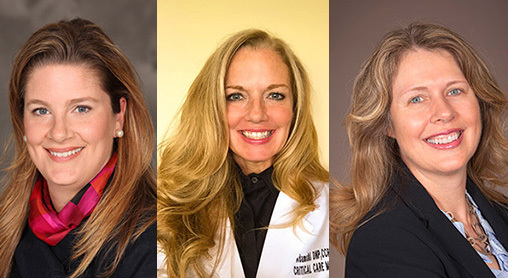 Three Emory Nursing faculty members earned top honors from the March of Dimes of Georgia at the organization’s 2017 Nurse of the Year Awards. Ferranti, PhD, MPH, is an assistant professor at the Nell Hodgson Woodruff School of Nursing. A nurse educator and public health nursing expert, Ferranti leads and coordinates many community health efforts at the School of Nursing. She also serves as the Faculty Advisor for the Emory Emergency Preparedness Student Nurses Association (EPSNA), where Ferranti supports the students and engages in collaborations with key emergency stakeholders within Atlanta and Georgia. Ferranti earned National Institutes of Health (NIH) funding for the Building Interdisciplinary Research Careers in Women’s Health (BIRCWH) program to investigate how diet quality affects the gut microbiome and cardiometabolic outcomes during pregnancy and postpartum among African American women. Adamski DNP, APRN, ACNP-BC, CCRN, is an assistant clinical professor and the Director of the Adult-Gerontology Acute Care Nurse Practitioner program at Emory University. Dr. Adamski is an expert critical care clinician and educator and serves as an APRN expert witness for trauma care nationally. She is a past Director of Advanced Practice leading clinical operations and serves as an independent consultant for APRN model development. As Director of Advanced Practice for a rural Level 2 Trauma Center, she designed an APRN practice model that save the health system more than $2 million over three years and decreased intensive care unit admissions by 37 percent in three months. She is an APRN representative to the Georgia Board of Nursing and leadership roles in multiple national organizations, including a board member for the American Association of Critical Care Nurses. She has received numerous distinguished awards for clinical practice, education and leadership. Her scholarship and areas of research include trauma prevention and system development, rapid response teams and critical care/trauma advances in hemorrhagic shock. Withycombe, PhD, RN, is an assistant professor at the School of Nursing. She has spent the last 14 years working with children and adolescents with cancer. During this time, she has made major contributions to nursing science such as identifying predictors for obesity development in children undergoing therapy for acute lymphoblastic leukemia (ALL). Twenty three percent of children treated for ALL will end therapy obese and another 20% will end therapy overweight. Withycombe has conducted two studies demonstrating that children are able to safely increase their physical activity levels both during and after cancer treatment. Through funding from National Institutes of Health (NIH) and the Oncology Nursing Society Foundation, she is exploring the relationship between physical activity, oxidative stress, and symptoms during therapy. In addition to her research, Withycombe is a mentor to numerous students, both within and outside the discipline of nursing. She introduced a research residency and Evidence-based practice courses to engage students in hands on research experiences that prepare nurses to understand and utilize evidence-based practice and nursing research to improve care delivery and patient outcomes.